Sanchez Production Partners (SPP) – Is this a $100 bill lying on the ground? Have you heard the old joke about the efficient market professor who walks down the street with a student who bends down to pick up a $100 bill? The professor tells her not to bother, because if the $100 bill were real, it wouldn’t be there. Well Sanchez Production Partners (SPP) kind of looks a little like that $100 bill. I’m not sure it’s real either, but I think it’s at least worth bending over to check it out. SPP is a small, 33 million market cap, formerly busted MLP, originally known as Constellation Energy Partners. It was picked up by the owners of Sanchez Energy (SN) last year to provide a GP/LP financing structure for funding SN via drop-downs to SPP. SPP’s assets are 60% midstream assets and 40% oil and gas production by EBITDA contribution. With the recently acquired midstream assets financed by the selling of 350 million in preferred shares to Stonebridge partners. 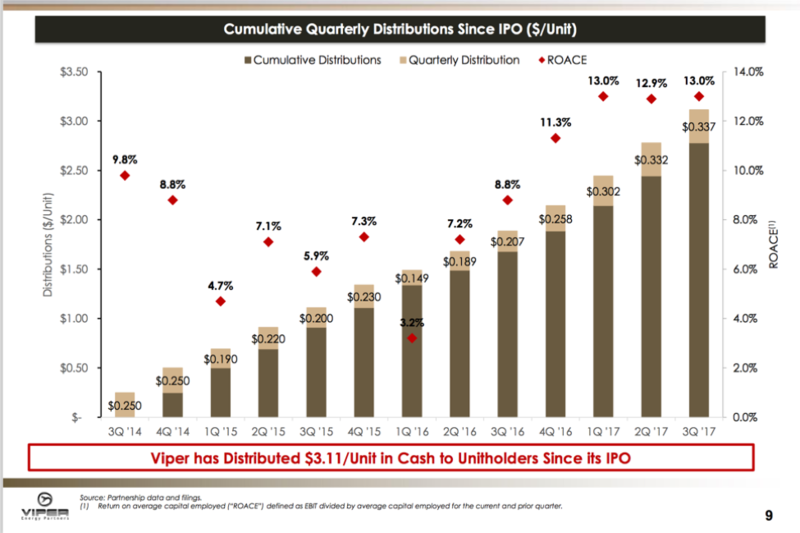 First the stunningly good news, on Nov 13, Sanchez initiated a forty cent quarterly distribution along with a plan for 15% distribution growth through 2019. At its current share price of $11, this is a 14.5% yield backed by 1.8x coverage for 2016. If the yield re-rates to 10%, the unis would trade for $16/share. And to top that, they also announced a 10 million dollar buyback on a stock that’s 1/3 the public float. So is there a catch? Well if oil prices jump back up before 2017, not really, because production is fully hedged at $74/bbl and $4.17/mcf through 2016. But… SPP is only partially hedged and at lower prices for 2017-19. If oil bounces back to $65 before the hedges run out, life is good. Otherwise, challenges will loom. First, lower oil prices will drop the coverage ratio. For example, the current $74 hedges and $24 operating expense leave a $50 spread, but $35 oil provides only a $10 spread. The current 1.8x coverage ratio is only possible because of the $74 hedges. Without higher prices, the distribution will funded only by the fee based mid-stream assets and the coverage ratio will drop to 1 at best. Furthermore, at low oil prices, SN won’t drill as many wells in the Eagle Ford which will result in less gas to process. Yes, there are minimum commitment numbers that help provide a foundation to the distribution, but the 15% distribution growth doesn’t occur unless the Catarina plant gets fully loaded, and that requires SN to drills more wells. The IR materials claim a 35% IRR on $60 oil, but no one is getting $60 anymore… Do they get 25% IRR on $50? So is SPP a $100 bill lying on the ground? Yes, if oil goes back to $60/barrel in 2017, but it’s a mirage if oil drops to $35/barrel for an extended period. In between those prices it can still work, but maybe only turns out to be a $20 dollar bill and I think still worth bending over to pick up. With the hedges solid for 2016, I’m long SPP, but I am keeping it on a short leash. Read about the 350 million infusion by Stonebridge partners. This provided the capital for the Catarina purchase and improved SN’s liquidity. Read the nitty-gritty in the full 8-k.
Nov 12 News Release announcing the distribution and announcing buy back. Nov 12 Q3 2015 Conference Call. My favorite part is describing that the limiting factor to the buyback is effectively the low trading volume. Management basically states that they will be buying 25% of the daily volume. There are also other moving parts in play, such as the planned sale of the legacy mid-continent producing assets, the health of Sanchez Energy, the appropriateness of holding production assets in a MLP, etc. But if I wait to write those down, I will never finish the post. The drill rig count in the shale era just doesn’t mean what it used to during the days of traditionally drilling. In the old days, cutting rigs immediately meant less new oil would be produced than the year before, but not anymore. New oil production = Number of new wells * the average production of the new wells. But in 2011, the average time for Anadarko to drill an Eagle Ford was 12 days, by the end of 2013, the average was 8 days with the record setting well only requiring 4.5 days. In 2015, it is reasonable to assume that the drilling time will be half of 2011’s rate, so only half as many rigs are required in 2015 as 2011. Furthermore, the average oil production from new wells in the Bakken and Permian according to EIA data has doubled in the last 5 years (Bakken) and 3 years (Permian). Everything else being equal, you’ll need half as many rigs with a doubling of production. Combine these two observations and a 2015 rig drilling in shale is 4 times as productive as a 2011 rig. Of course, that’s an oversimplification since no rig stays busy 100% of the time. But at the same time, I imagine the remaining rigs are running with the best crews on the best locations, so don’t be surprised if a drop in the rig count doesn’t result in a dramatic decline in production. Its not your father’s rig count anymore. So just how much are Incentive Distribution Rights (IDR) worth? Let’s walk through OneOK (NYSE:OKE)’s IDR agreement to get an idea. OneOK Partners (NYSE:OKS) is a midstream Master Limited Partnership which invests in natural gas midstream processing facilities to extract natural gas liquids from “wet” gas into its more valuable components. OneOk Partners also owns significant natural gas pipelines and gas gathering systems to bring the gas from the wellhead to the gas plants as well as ship it to interstate pipelines. The general partner of OKS is OneOK. OneOK owns 2% of the shares assigned to its general partner stake which controls OKS as well as 39% of the limited partner shares of OKS. The remaing 59% of OKS is owned by the general public. While I strongly prefer OKE over OKS, I do consider it a good sign for OKS owners that OKE’s high ownership percentage of the limited partner shares does provide some measure of alignment between OKS and OKE. However, as we shall see below, the GP receives just about as much in distributions from OKS for its 2% GP share that it does for its 39% stake in the LP shares. 50 percent of amounts distributed in excess of $0.4675 per unit. With OKS currently paying $3.01 in distributions per unit over the last twelve months, the payout is so much higher than the highest threshold of $.4675/unit that almost all of the distribution is subject to the 50% IDR payout. And critically, the GP gets this gain on total units, not just growth in the existing units, so every new unit that OKS issues increases the IDR payment as well. The IDR payment of 259 million is just 9 million less than the amount OKE receives for owning 39% of OKS. In effect, the IDR is worth about 38% of OKS!